You've seen the commercials and have maybe noticed an ad or two for the cash back app Ebates... but is it real? 1. My mom (who reads all my articles... Hi/thanks, mom!). 2. A regular Side Hustle Mom reader. 3. A new reader who was searching the web for unbiased reviews for Ebates. Whether you identify as 1, 2, or 3, you have come to the right place, as I am going to tell you about my experience with Side Hustle Mom and whether or not I -- in my experience hustling -- consider it to be the best cash back app. Let's start with the basics: What the heck is Ebates? Essentially, Ebates is a middle man/affiliate marketing site that scours the web for the best deals/cash back offers, notifies their users of these sales/cash back offers, and then gives the user 50% of the commission made for using their referral link. 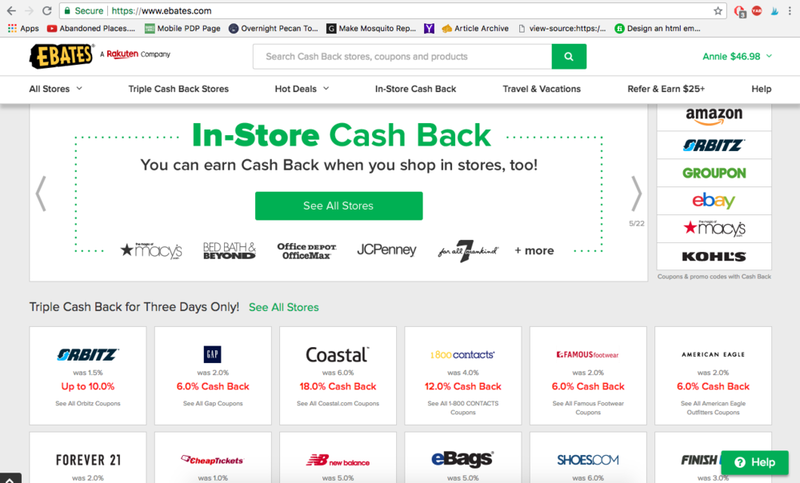 "Since our founding in 1999, Ebates has helped its members — 10 million and counting — earn over $1 billion in Cash Back at their favorite stores," explains Ebates, adding that "By connecting these savvy shoppers with America’s best brands, we give them a hassle-free way to save money on the things they buy every day, while our retail partners find loyal new customers and drive record sales." In the world of affiliate marketing, this is pretty ingenious. 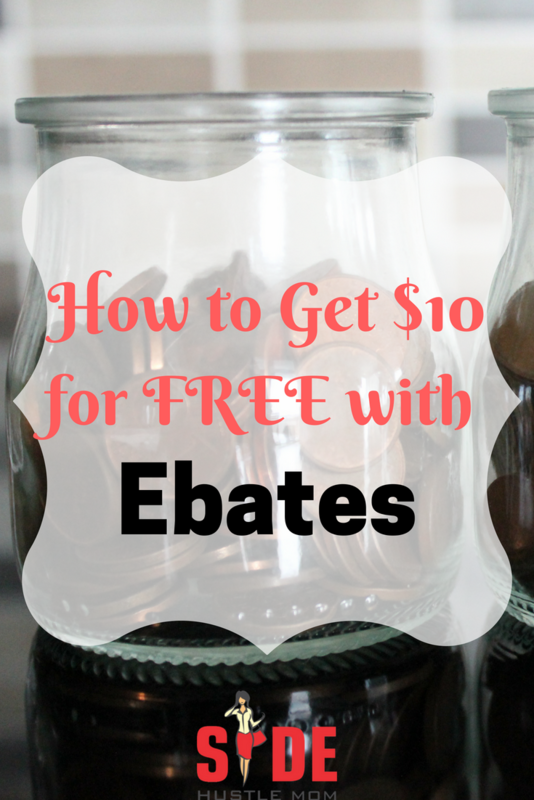 Now that you know the basics of Ebates, just how does it work? Basically, all you need to do is go to their site/app, find the online store you're planning to shop with by either scrolling through their list or typing it in the search bar, clicking the link (which will instantly re-direct you to the Amazon, Target, eBay, etc. homepage), and shopping like you normally would. As you can see from the screenshot above, each box tells you just how much cash back you can receive through Ebates, but keep in mind that it may be subject to certain categories (like with Amazon, whose cash back is -- as of this writing -- only valid for Prime Apparel, Amazon Devices, Dash Buttons, etc.). Now for the Million Dollar Question: Is it legit? Do you really get cash back? Then the next time you shop through your Ebates link, you get that allotted percentage added into your account. As of this writing, I have made $50+ via two separate checks... and literally all I have done is added 5 more seconds to my shop time in order to access the website through the Ebates app. In conclusion, Ebates is a totally legit and totally free way to earn money back on stuff you were already planning to buy, which is why I recommend it to EVERYONE! If you are ready to get started on making easy money, follow my link, which will not only get you set up, but will give you a FREE $10 after you spend $25 online. In this day and age, one of the most profitable of opportunities is that of food delivery, which gives drivers with the opportunity to work when they want/can and get paid every day! With so many of these different companies, however, just who do you choose? Which of these main food delivery companies pays the most? We have done the research and here is what we found.